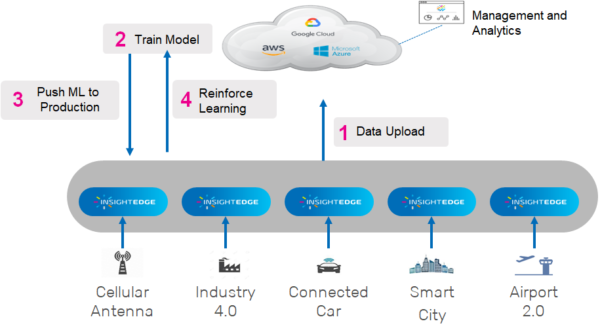 InsightEdge is designed for the edge cloud, delivering a real-time analytical distributed fabric at the edge of the network, which acts as an extension of the cloud for mobile carriers, Industry 4.0, smart cities, Airport 2.0 and more. Each InsightEdge cloudlet acts as a small-scale IoT hub, that provides machine-learning services and event-driven analytics located closer to the users and devices. InsightEdge enables real-time feedback across business operations, fast innovation over analytical workloads, and the ability to unlock live operational intelligence across the business at the edge for instant action at the level of the user/device. The in-memory real-time analytics platform provides all of the necessary components of an edge cloud layer distributed architecture, which unifies operational and analytics workloads in a single platform to empower real-time analytics and ML on any data – sensors, logs, images, etc. for instant insight to action. Ingest, process and analyze millions of events per second without performance tradeoff by sharing data across streams leveraging in-memory computing technology. InsightEdge supports any data type, including structured, unstructured and semistructured data. Co-location of analytics and applications act on time-sensitive data in a highly efficient, distributed manner delivering microsecond response times. Running analytics at the edge can also filter and decrease the amount of information that is backhauled to the datacenter, or cloud for storage, and further analysis. This reduction in the consumption of network bandwidth is key to cost savings and efficiency.